A seventy-eight-old man, Lawrence Ayeni and four others have been arrested by the men of Ekiti State Command of the Nigeria Security and Civil Defence Corps (NSCDC) for allegedly defrauding a Nigerian based in the United States (U.S.), Okechukwu Omeniho, of N300,000. 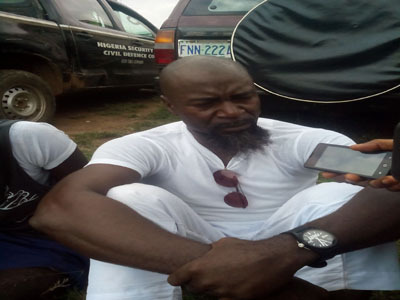 Ayeni, a suspected ritualist, was arrested yesterday alongside four other members of his gang inside a bush at Iwaro, Oke Ila Quarters of Ado-Ekiti, where they were performing rituals on Omeniho. Their victim was believed to have been charmed, under the pretext of appeasing gods of fortunes and prosperity for him. According to the Nation ,Omeniho (49), when rescued from his captors by the NSCDC, could not explain how he fell into the hands of the fraudsters and ritualists and committed such a huge amount of money to people he had never met before after being tricked from his base. According to the Commandant of NSCDC, Donatus Ikemefuna, Omeniho is a businessman who hails from Owerri, Imo State but resides in Atlanta, Georgia, U.S. The victim wept uncontrollably when the suspects were paraded shortly after their arrest. “We are encouraging any defrauded victim to come out and identify the suspects paraded or give details of their experiences so that the activities of these occultists and fraudsters can be eliminated completely,” he said.